Yarrawonga is a town on the Murray River, 215 km north-east of Melbourne. It is linked to Mulwala, on the opposite side of the river in New South Wales, by road and railway (1932), and the Mulwala munitions factory is a source of employment for residents of Yarrawonga. Lake Mulwala (1939) on the Murray River has recreational frontages to Mulwala and Yarrawonga. Yarrawonga was named after a pastoral station taken up by Elizabeth Hume (sister-in-law of the explorer, Hamilton Hume), in 1842. The name is thought to be derived from an Aboriginal word meaning place where the wonga pigeon rested, or water running over rock. Elizabeth Hume's homestead, Byramine, was built in 1842 and is on the Australian and Victorian historic buildings registers. It is in the locality of Burramine, which is about 14 km west of Yarrawonga. A police camp was established at Yarrawonga in about 1850. 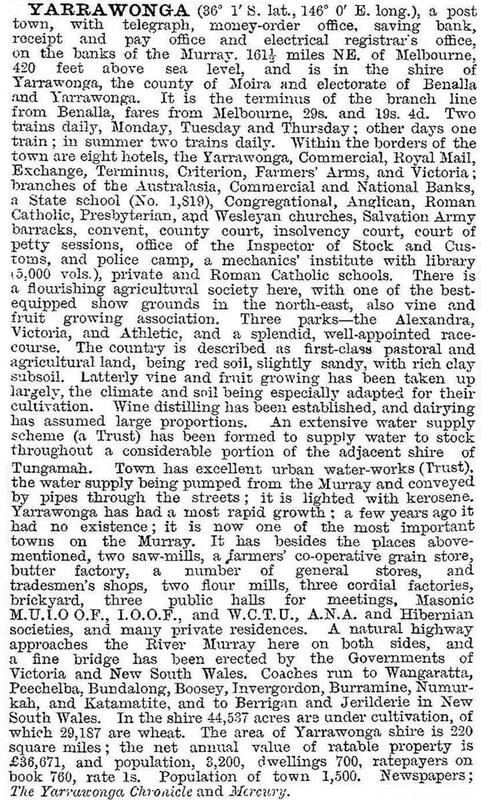 In 1868 a town was surveyed at Yarrawonga, occupying the four blocks bounded by Witt, Hume, Orr, and Hovell Streets near the river. Town blocks further south were surveyed in 1875 and 1886. The railway from Melbourne reached Yarrawonga in 1886. A road bridge across the river to Mulwala was built in 1891, replacing a punt that had operated since 1850. With the opening of the railway wheat and livestock were easily transported to Melbourne markets and the township rapidly grew from a few hundred persons to over one thousand. In 1878 the Yarrawonga shire was created, extending from Cobram in the west to the Ovens River in the east and southwards to the boundary of Benalla shire. The shire's area of 813 square miles, which included Tungamah shire, was trimmed down to 242 square miles by 1891, which remained its area until amalgamation in 1994. In 1957 the first of Yarrawonga's aquatic festivals was held. Lakeside camping and activities increased, quadrupling the local population during holiday times. Lake Mulwala has an area of 6000 hectares and 43 km of shoreline. There are seven boat ramps and two swimming pools. Alexandra Park has an oval, tennis courts and 500 caravan sites. There are bowling greens, a golf course bordered by State forest and facilities for fishing and shooting. The area attracts retirees: by 1996 nearly 19% of the population were over 65 years compared with a regional average of 14.1%. At the 2011 census the respective percentages were 28.5 and 14.2. The town has State and Catholic primary and secondary schools, a hospital, a showground, several local industries, an aerodrome, a livestock saleyard and a regional grain receival depot (1963). There is a visitor information centre near the lake, along with the colonial customs house. Within the shire as a whole there were 777 bed spaces in camping areas and 410 bed spaces in hotels and motels in 1995. Yarrawonga annually has more hours of sunshine than Brisbane. Yarrawonga college P-12 had 818 pupils in 2014. In 1994 the shire had 23,000 head of cattle, 78,000 sheep and lambs and harvested over 16,000 tonnes of wheat. Farms occupied over 51,000 hectares or 81% of the shire's area. On 18 November 1994, most of Yarrawonga shire was united with Cobram, Nathalia, Numurkah and most of Tungamah shires to form Moira shire. Yarrawonga has a service centre for the shire, which is headquartered at Cobram. A new bridge was planned between Yarrawonga and Mulwala by 2020. In 2014 Yarrawonga had the highest percentage (99%) of immunised children in the nation according to data from the National Health Performance Authority.